Please pray for the repose of the soul of Stephanie McElligott, grandmother of Andrew, Jack, Maddie and Charlotte de Keratry, who passed away suddenly on Ash Wednesday. Keep the de Keratry family in your prayers during this difficult time. Two family members of Madison and Meagan Pham are still in need your prayers: The girls&apos; paternal grandmother, Nu Thi Do, has been diagnosed with Stage IV cervical cancer and will not be undergoing chemo. Please pray for her, that she will be comfortable and happy for the rest of her life. Also, the Pham girls&apos; paternal uncle, Tien Pham, is battling colon cancer and going thru chemo. Please pray for the Pham family as they go through this difficult time. Also, keep in your prayers Linda Klein, grandmother of Madeline Faison, and her family as she battles with aggressive terminal cancer. Keep Robyn Paliotta, grandmother of Christopher and Sofia Petromilli, in your prayers, as she undergoes her cancer treatment. Pray for Karen Vandiver, great grandmother of Alaina and Davyn Schoppa who is battling breast cancer. Please pray for Joe Hill, husband of former CSSE teacher and librarian Lynn Hill, who was recently diagnosed with cancer. The school cafeteria will be closed on the 23rd of April. The cafeteria staff will be attending a food show looking for new and different ideas for our cafeteria. Please make sure to send your childs lunch on this day. If you have any questions please do not hesitate to call me at 751-0067 ext.122. Remember all those raffle tickets we sold to raise money for the Gala? We met our goal as a school, so all CSSE students get to enjoy a free dress WEEK starting next Monday, April 1st. See below for daily themes and guidelines. We will be having a general meeting on Tues. April 2 in the gym @ 6:00pm. Come hear what PTO has accomplished this year and meet next year’s board. 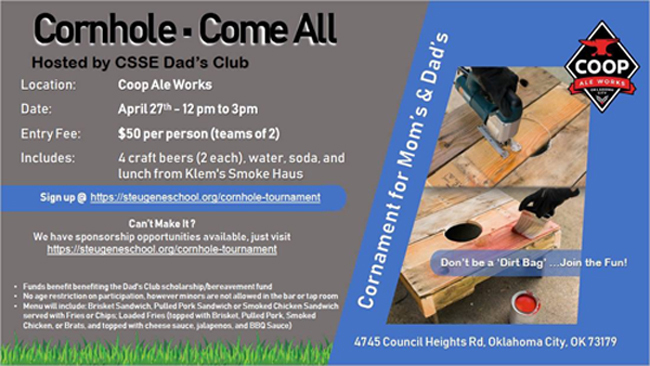 Please have at least one parent attend. Free dress day for kids that have a parent sign in. No child care will be provided. Did your kids have a growth spurt this year? Good news! Bring outgrown uniform items to the PTO meeting next Tuesday, April 2nd for the uniform exchange. Donate the outgrown items that are still in good condition and pick up a couple items that fit. Uniform exchange is FREE! St. Eugene School has been blessed with a wonderful Spanish program headed by our dear Señora Fox-Arrington. After more than 20 years at St. Eugene, Señora will retire at the completion of the current school year. If your child has a lovely "r" trill and can pray The Lord&apos;s Prayer with a beautiful Spanish accent, it&apos;s because of Señora. Please take the time to thank her for cultivating a love of the Spanish language and culture within our students. Do You Love to Dance and Boogie? Tippi Toes classes will get you moving and grooving all semester long! Tippi Toes Dance offers enthusiastic and engaging dance classes for boys and girls. Class at St. Eugene’s will focus on Ballet, Jazz & Tap technique, while encouraging creativity and self-expression. Using original Tippi Toes music, Tippi Toes instructors will guide dancers through weekly lessons that promote a life of confidence, compassion, and FUN! Dancers will have the opportunity to participate in a spring recital in May to celebrate all that they have learned! Please return any overdue books and pay any fines on your child&apos;s library account so he or she has a clean slate for the 4th quarter. Emails should be coming home automatically when something is overdue. If you have questions, contact Mrs. Hattaway media@steugeneschool.org. Library policies are here. This year our school is participating in Operation Rice Bowl through Catholic Relief Services. The rice bowls will be going home Monday, March 4th. 75% of donations to CRS Rice Bowl supports Catholic Relief programs around the world, and 25% supports local hunger and poverty alleviation efforts. For more information about how you can make this service project more meaningful for your family please go to CRSRiceBowl.org. 1. The guide put together by FlynnO’Hara is our official guide for uniforms for Mass and casual days. Some items are optional while others you may find from other locations, however, Flynn O’Hara is encouraged. 2. Our school receives 5% cash back when CSSE purchases are made! 3. Free shipping on orders over $50.00! 4. Items that parents have purchased previously will still be allowed to be worn as long as they fit the uniform guidelines. 5. We will retire the Lands End items for purchase this Spring. 6. To make purchases, visit our personal CSSE FlynnO’Hara site. Join us for a Lenten Retreat for Women on Saturday, March 30 from 8am. to 5pm. in the Meeting rooms at St Eugene. Cost is $40 for breakfast, lunch and supplies. Contact Patty Deardon - pyardley@steugenes.org; Judi Wilkinson - jwilkinson@steugenes.org. Sign Up Seminar for parents and godparents of children ages 4-17 will be Sunday, March 31. English presentation at 10:45 am and Spanish presentation at 1:30 pm. THIS SEMINAR IS REQUIRED. Godparents must bring copies of certificates of Baptism, Eucharist, Confirmation and Marriage (if applicable). If godparent isn&apos;t a member of St. Eugene Parish, he/she must bring letter from own parish stating that he/she is a practicing member. Classes for children ages 7-17 will be Sunday mornings, April 7 and April 14, 10:45 am - Noon, Meeting Room 1. 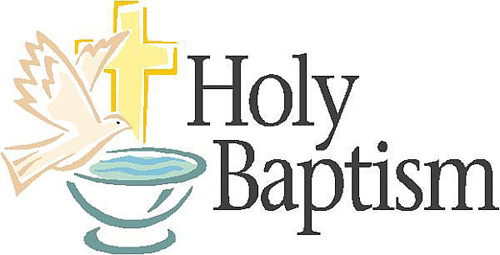 Baptisms will be Saturday, April 27 at 8:30 am.